Catch and release fishing is an increasingly popular practice among many anglers. It is quite common for fishers with a strong conservation commitment to release fish that they could legally keep. Compliance with bag and size limits and various fishing closures also means many anglers, by law, return fish they have caught to the water. Recent research has shown that most fish survive using current catch and release techniques with the main factors found to reduce survival being deep hooking and poor handling. Target fish using artificial lures. Choose non-offset circle hooks when using bait. A guide to using circle hooks. 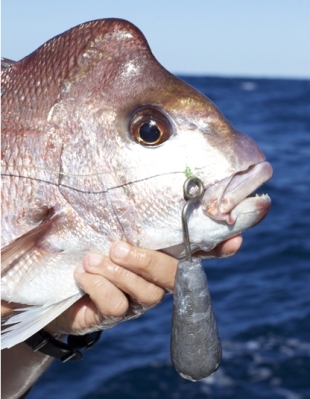 If the fish is hooked deeply, cut the line as close as possible to the fish’s mouth rather than removing the hook. Compared to removing swallowed hooks from bream and mulloway, simply cutting the line increased their short-term survival from 12% to more than 85%. Up to 76% of the released line-cut, gut-hooked bream then shed their hooks within around three weeks. Minimise the length of time the fish is out of the water. Ideally unhook fish while it is still in the water. Try to remove hooks and release fish as quickly as possible. The use of needle-nosed pliers or hook retrieving devices can greatly reduce time spent unhooking. Remove hooks from mouth-hooked fish. Use fish-friendly landing nets with soft knotless mesh. Avoid knotted landing nets which may damage the fish’s scales, skin, eyes and fins. If live wells are used, maintain good water quality by using flow through, aerated system. Poorly designed live wells reduce fish survival – particularly silver trevally where survival dropped from 98% to 63%. Use suitable tackle for the species that you are targeting and minimise the time spent to land the fish. Use barbless hooks or hooks with reduced barbs to make hook removal easier and minimise hook damage. This can be achieved by squeezing barbs down with pliers, or filing down larger barbs. Handle fish firmly and carefully. Avoid dropping fish onto the bottom of boats and other hard surfaces. Use wet hands or wet gloves when handling fish to minimise damage to its skin. A smooth, wet surface or vinyl covered foam is the most suitable surface to place fish on in order to remove hooks. Remember, many surfaces, especially metal, can become very hot in the sun. Do not hold fish by the gills or the eyes. Take care to revive fish upon release if they appear exhausted (struggling to hold themselves upright and/or unable to swim away). Gently hold or push the fish through the water so that it obtains a good flow of water over its gills. If there is any water current, hold the fish upright facing towards the current until it starts to show signs of recovery. If you are going to take photos of your fish before release, support the fish properly. When many fish species are caught from water deeper than 10 metres, they can suffer a range of injuries due to the changes in pressure, known as barotrauma. Barotrauma results from the expansion of gases in the swim bladder and other organs when fish do not have time to adjust to the rapid changes in water pressure as they are pulled towards the surface. The affects and severity increase with depth of capture and susceptibility varies between species. Physical effects include inflated abdomen, bulging eyes, stomach pushed outside the mouth and distended intestines. Using a release weight to return them to depth. It is recommended that fish displaying mild barotrauma should be released as quickly as possible following capture with no treatment. Most of these fish should be able to swim down to depth by themselves. However, if the fish is excessively buoyant and unable to submerge by itself, a release weight should be used to re-pressurise the fish back to depth. Due to the inherent risk of further (stabbing) injury caused by a venting tool, venting should only be used as a last resort if a release weight is not available, the operator is experienced and other risks such as predators are present. 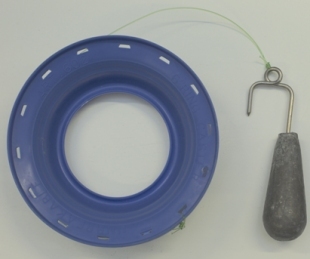 Release weights are generally used with a hand spool although they may be used with a spare rod. Usually 30 metres of line is sufficient to re-pressurise the fish enough to swim off the line. 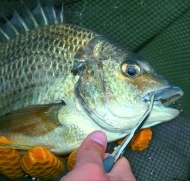 Attach the release weight through the top jaw of fish (or into the soft tissue at the side of the mouth). Ideally, one person holds the fish whilst a second person holds the handle-line or rod ready in free-spool. Carefully place the fish into the water head first and let the attached line run free from the spool as the fish is released. It is important to get the fish as deep as possible before it is released from the weight. Try not to cause any sudden jerking whilst fish is descending as this may dislodge the weight from the fish before it safely reaches the bottom. The fish will often swim free of the weight as it re-compresses, otherwise a sharp lift should dislodge the barbless hook so that the release weight can be retrieved. Release weights may be purchased from good tackle shops or you may make your own using a large snapper sinker and a barbless hook. Remove the barb from the stainless hook using a metal file. 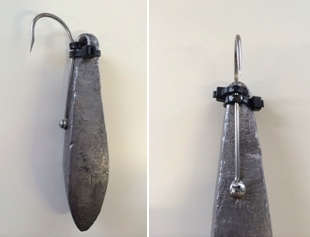 Lay the hook on the sinker, with the hook shank finishing at the top of the sinker. Use a small screw and secure the hook to the sinker (You may have to drill a small pilot hole). Use two cable ties to secure and strengthen the hook position to the top of the sinker. Attach heavy mono (~ 80-100lb), Venetian cord or similar to the bend of the hook. Approximately 25-30 metres of line should suffice. A hand spool will help keep the line tidy and tangle free. Studies carried out on recreationally caught-and-released mud crabs and eastern rock lobster have demonstrated that these species are particularly hardy. Most impact caused by catching these crustaceans is limited to physical damage; most of which occurs during handling. While such damage did not cause any mortality in the research, it is important to acknowledge that wild crustaceans that lose appendages (especially claws/swimmers for mud crabs and antennae for lobsters) may be negatively impacted in terms of feeding, predator defence and reproduction. Check hoop nets regularly and avoid 24-hour sets (to minimise damage to both crabs and gear) whenever possible. 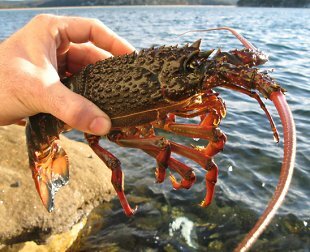 Release unwanted lobsters at the capture locationand preferably underwater to minimise predation. 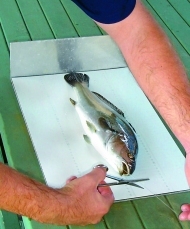 A catch and release measuring mat has been designed to help anglers accurately record their catch. The mats include full colour illustrations of the most popular saltwater & freshwater species of fish and conversion tables so the approximate weight of a fish can be estimated from its length measurement. They also include tips on the best methods to use to ensure the fish is given a maximum chance of survival after release. 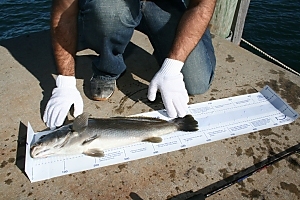 Large graduations on the ruler can help in the many 'Catch, Photograph and Release' fishing competitions that have emerged in recent years. The mats are manufactured from a UV stable material. For technical enquirers please contact NSW DPI on (02) 4939 8888 or toll free hotline 1800 025 520.